Next week might be Independence Day in the United States, you know, where we celebrate our Independence from Mother England. But. It’s also kind of the mother of all cookout holidays. And while there will always be room for traditional favorites, this twist on traditional coleslaw is one of the best things I’ve made all year. The first time, we had it on grilled bratwursts and my kids were all, “Ew, Mom, my food is multicolored and therefore dangerous!” But one bite and every single kid finished their food and couldn’t stop talking about how delicious it was. The next time, we put it on tacos (it would be amazing on fish tacos!) and same reaction. It’s incredibly versatile–you could add some fresh pineapple and/or cubed mango for some sweet, Latin flair, or crushed ramen noodles and grilled chicken for a great main dish salad. 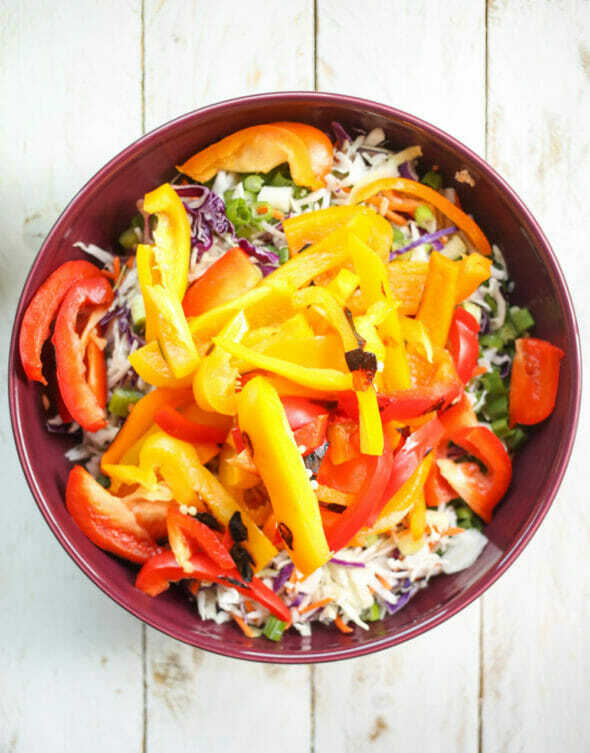 You’ll need colored bell peppers, coleslaw mix, mayonnaise (light is fine), whole grain mustard, salt, pepper, sugar, and apple cider vinegar. Wash and dry the peppers. Set aside. Heat a large cast iron skillet over high heat. 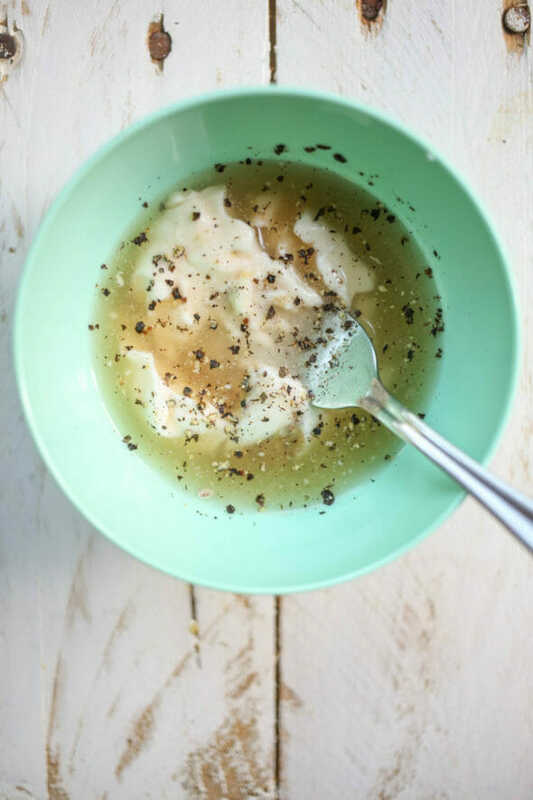 While the skillet is heating, whisk together the vinegar, mayonnaise, sugar, mustard, salt, and pepper in a small bowl. Set aside. 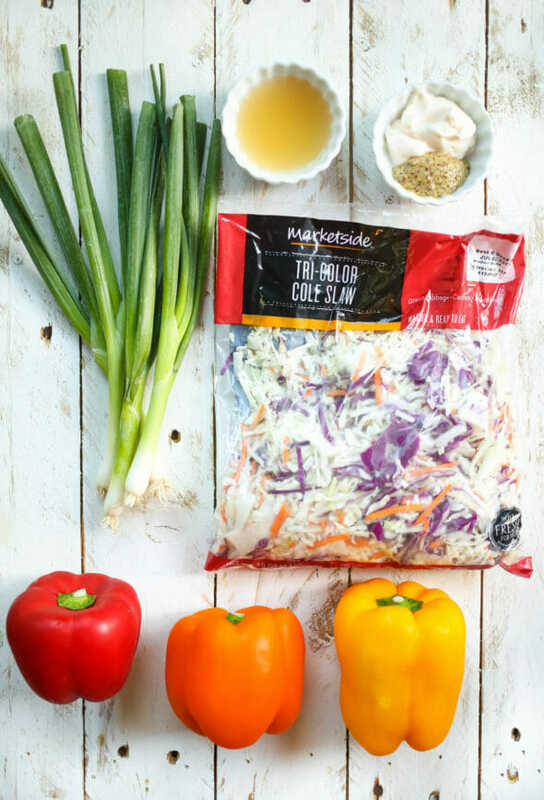 While the peppers are charring, toss together the coleslaw mix and the chopped green onions. then toss with the dressing. Allow to stand for at least 10 minutes. Season with additional salt and pepper to taste and serve as a side dish or as an incredible topping for grilled sausages, hot dogs, burgers, or tacos. 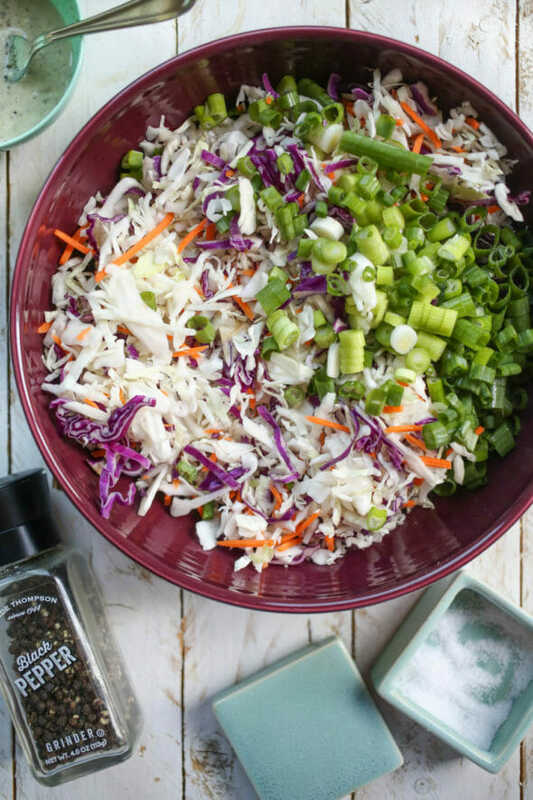 A flavorful twist on traditional coleslaw, incredibly delicious on bratwursts, grilled hot dogs, tacos, and burgers. 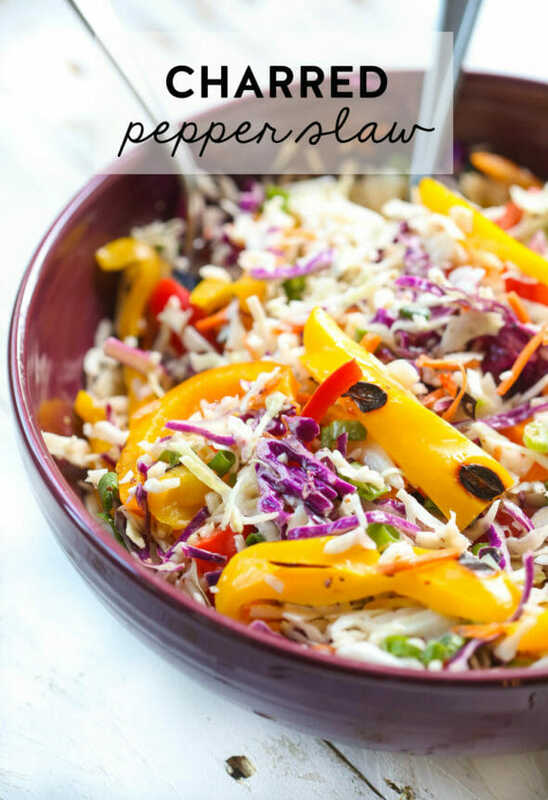 While the peppers are charring, toss together the coleslaw mix and the chopped green onions. 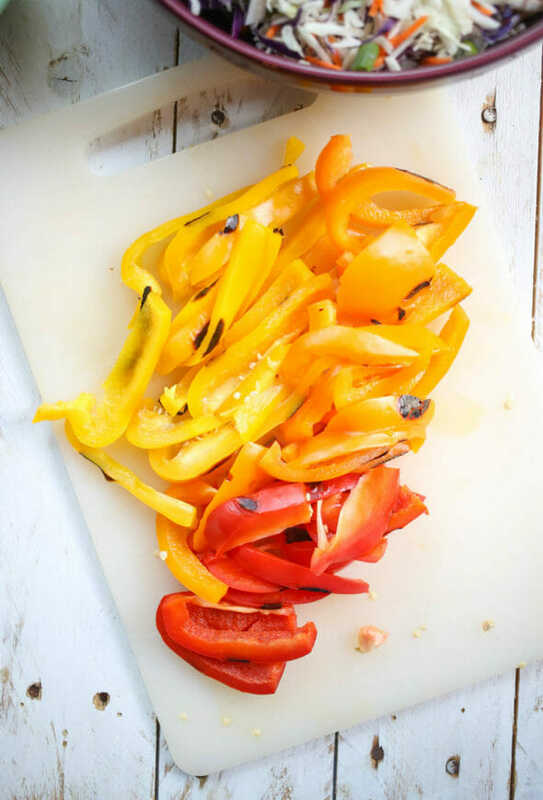 When the peppers are charred, very carefully remove them from the pan, remove the tops and seeds, and slice (they will be hot and will probably steam when you cut them open. Please don’t sue us if you burn yourself.) 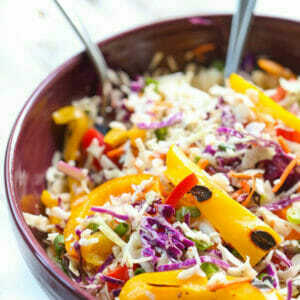 Toss the charred peppers in with the coleslaw mixture, then toss with the dressing. Allow to stand for at least 10 minutes. Season with additional salt and pepper to taste and serve as a side dish or as an incredible topping for grilled sausages, hot dogs, burgers, or tacos. Eating so many tacos this summer … can’t wait to add this for some variety and pop of color!! This would be delicious on homemade sloppy Joe’s!! Can’t wait to try it! I made this for my 4th of July BBQ and it was AMAZING!! Along with your Red, White & Blue Texas Sheet Cake and the Mexican Street Corn Salad, all soooo delicious! I seriously tell everyone I know about your site and recipes, thank you thank you!! Can’t wait to make this. I make my sauce from scratch sililarly but I never thought to put mustard in it! Great idea. I Alain add cilantro to mine and I think it would be great in this one.